When you run the Web application, you must first log in. More information about logging in can be found in the Authentication section. The user interface is loaded immediately after a successful login. The header contains the dashboard management panel. 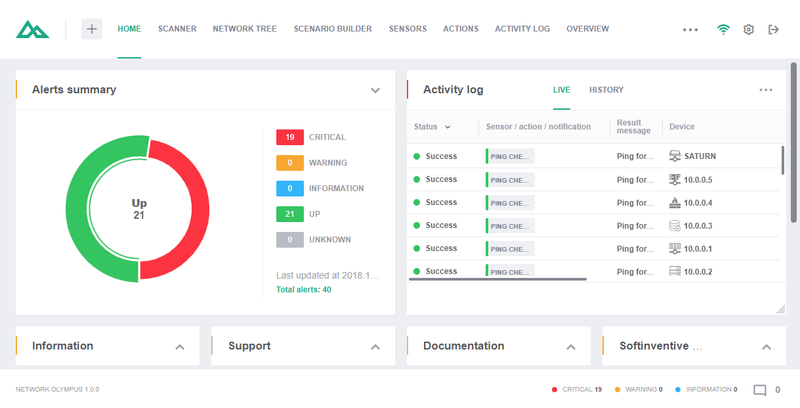 From here, you can switch between various dashboards, as well as create new dashboards and widgets. On the right side of the header is the indicator of connection status with the Network Olympus web server. You can also access program settings here. A dashboard is a separate space that contains widgets. Each dashboard stores information about the location of the widgets. A widget is a key element of the interface. It displays specific information or allows you to perform certain actions. Widgets can be moved similarly to the way you move windows. Widget positions are automatically aligned in the grid. Use the + button in the header to add an empty dashboard or to add one of the widgets to the current dashboard. 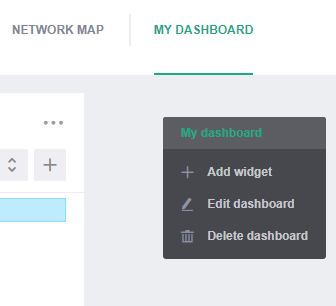 Widgets can also be added using the context menu in the empty space of a dashboard. Any widget can be minimized and expanded from a menu in its top right corner. You can open its settings from here too. At the bottom of the page is the status bar. The application version is displayed on its left side. You can open the license information panel by clicking on the version. To the right, information about the sensor statuses is displayed, sorted by their severity. This area is also used to display system messages to the user. A sidebar containing the previously shown system messages can be opened from here.